Can't find what you're looking for? Call us; we can create a custom listing to meet your needs. Coaster Call™ IV is the most advanced coaster pager on the market. The system is easy to install and maintain. The coasters stack on top of each other on a charger base. When removed, they flash for five seconds to indicate what a page looks like. 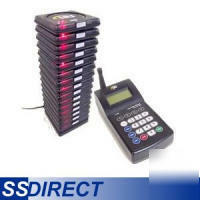 Coaster Call™ IV contains advanced features that are not available with any other paging systems. * Staff knows who has been paged. * Guests won’t miss the call. * Visual paging alerts guests and staff. * Guests can be greeted by name. We have successfully configured and installed systems in everything from clubs selling $30,000 in one night, to small "Mom & Pop" shops.